Say Tel Aviv and one of the first things that comes to mind is sand – lots of it. Tel Aviv’s famed Mediterranean beachfront stretches more than ten miles from north to south, and is lined by mainly high-rise beach hotels that at first glance put the definitive stamp on the city’s touristic character. Collectively, however, they’re only one chapter in a far more interesting book whose pages are made up of a tangle of boulevards and side streets turned away from the coastal fray. That’s where you’ll the best Bauhaus architecture, coolest restaurants, and increasingly, the most interesting boutique hotels. 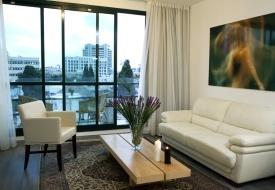 The best of the batch is with no reservations Townhouse Tel Aviv , which has just 19 rooms in a completely refurbished eclectic 1932 townhouse that’s located a few steps from hip, bustling Rothschild Boulevard. It’s a neighborhood where myriad cafes and restaurants like Shulchan tempt travelers and hungry locals alike. As would befit an upscale urban residence, no two rooms of Townhouse are alike, in terms of both layout and furnishings. The latter were supplied by Kastiel, a famous Israeli furniture maker that outfitted the first seats for the Knesset, Israel’s legislative assembly. The furnishings are chic and varied by design, meaning the gleaming white velvet headboard that accentuates one guestroom might sport a striped pattern in another, and other touches like animal print area rugs vary from room to room. Bathrooms are sleek, and some rooms have small balconies with great city views. Introductory room rates at Townhouse in June start at $205/night for a standard double and that includes continental breakfast from neighboring Bakery 29, which is hands down the best bakery in Tel Aviv (I have yet to find a chocolate chip cookie in New York that, bite for bite, matches the scrumptiousness of the ones you’ll find here – and I eat a lot of cookies). Plus there are complimentary refreshments available throughout the day in the posh but convivial lobby. On the other side of Rothschild Boulevard, on leafy Mazeh Street, Hotel Diaghilev has 54 rooms and suites, with even the smallest exhibiting more of a furnished apartment flavor than your typical hotel room; mini-kitchens and bedrooms separate from the living room area are the norm. The mix of layouts and unique furnishings makes this a destination hotel. As would befit a renovated Bauhaus building, many of the rooms feature wraparound balconies where you can chill with an evening cocktail or plan your day over morning coffee. Then there’s the art: every four months or so, a new show of Israeli art takes over the lobby, extending into other parts of the hotel as well. Try finding that at a Hilton! Room rates in June start at $180/night, including a voucher for breakfast at a selection of nearby cafés. In the coming months the owners of the Diaghilev will be opening a new boutique hotel called the Rothschild, on the boulevard itself. If it’s anything like the Diaghilev, in style or spirit, there will be much to look forward to. Other boutique hotels in the area are in the works. Now, if you do want to be near the beach (an understandable option, especially in summertime) but not stuck in a cookie-cutter hotel, I have two recommendations: the first is the Hotel Savoy, a grandiose name for a small but basically irresistible hotel whose urban, black-and-white aesthetic is joyously diluted by its location on charming Geula Street, close to one of the best stretches of beach in Tel Aviv. Rooms are modest in size but clean and fresh, and start from about $150/night. Then there’s a truly secret beach hotel managed in part by a guy who, according to the website, “has become one of Israel's visionaries and God has made him a blessing to his people as well as a well-known international conference speaker." Be that as it may, the modern Hotel Gilgal is a find, and a bargain at that: single rooms with breakfast (there are half board options as well) start at just $160, doubles at $190. And for those who can’t say no to a sultry sea breeze, there’s a “secret” wide rooftop terrace, too. See our Tel Aviv destination guide for general trip-planning information, then use our Travel Search price comparison tool to find the lowest rates and travel deals on flights, hotels, vacation packages, and more.